Student innovators and entrepreneurs took home a total of $14,500 in cash and prizes as winners of the 2013 TOP DAWG New Venture Championship held this past week at Louisiana Tech University. Awards were presented to the top three teams in the competition as well as to teams demonstrating entrepreneurial spirit and best presentation. Each of the teams reached the New Venture Championship after competing in the TOP DAWG Idea Pitch this past October. “VOD” won first place honors and a $3,000 cash prize for their diagnostic tool which helps caregivers of persons with sickle cell disease. In addition to the first place award, the team, consisting of biomedical engineering majors Francais Decuin, Uttam Dhodary, Madison McLeod, and Matthew Plaisance, won the $1,000 Innovation Enterprise Fund award. The “VOD” team also won the $2,000 Ruston-Lincoln Parish Business Awards Best Presentation Award. The prize is funded through proceeds generated from the Ruston-Lincoln Parish Business Awards Breakfast, a collaborate event of the Ruston-Lincoln Chamber of Commerce and Louisiana Tech’s College of Business. Second place and $1,500 was awarded to “KHBS” for developing assistive technology products for power wheelchairs. 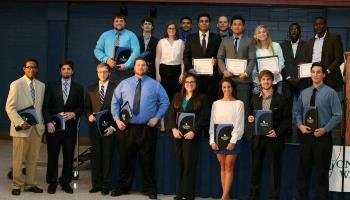 The team was comprised of biomedical engineering majors Daniel Bankard, Stratton Haywood, Sanjog KC, and Keshab Sapkota. Nanosystems engineering students Hunter Montgomery, Amin Saleh, and Nikesh Shrestha formed “Gcap,” which won third place and $500 for developing a graphene image recognition software. In addition to the cash awards, the Louisiana Tech Enterprise Center sponsors each of the winning teams, providing them with six months of incubator space and support valued at $4,500. “ConnectOne” won the $2,000 Jones Walker Entrepreneurial Spirit Award, which recognizes the team with the most entrepreneurial spirit. The award was presented to team members Evan Puckett, a management and entrepreneurship major, and Kaitlyn Gallegos, a marketing major, who developed an auxiliary cord which helps iPhone case users access their music more conveniently. Since its inception in 1937, Jones Walker has grown over the past several decades in size and scope to become one of the largest law firms in the United States. We serve local, regional, national, and international business interests in a wide range of markets and industries. Today, we have more than 375 attorneys in Alabama, Arizona, California, the District of Columbia, Florida, Georgia, Louisiana, Mississippi, New York, and Texas. For more information, visit www.joneswalker.com. Supporting sponsors for the TOP DAWG Idea Pitch and New Venture Championship include Louisiana Tech’s College of Business, College of Engineering, Center for Entrepreneurship and Information Technology (CEnIT), Enterprise Center, and Technology Business Development Center (TBDC).